(A) “Security Instrument” means this document, which is dated ___________________________, _______, together with all Riders to this document. (B) “Borrower” is ____________________________________________________. Borrower is the trustor under this Security Instrument. (C) “Lender” is ______________________________________________________. Lender is a ______________ organized and existing under the laws of ________________________________. Lender’s address is ________________________________________________________________. Lender is the beneficiary under this Security Instrument. (E) “Note” means the promissory note signed by Borrower and dated _______________________, _____. The Note states that Borrower owes Lender _______________________________________ Dollars (U.S. $__________________) plus interest. Borrower has promised to pay this debt in regular Periodic Payments and to pay the debt in full not later than __________________________. (G) “Loan”means the debt evidenced by the Note, plus interest, any prepayment charges and late charges due under the Note, and all sums due under this Security Instrument, plus interest. (I) “Applicable Law” means all controlling applicable federal, state and local statutes, regulations, ordinances and administrative rules and orders (that have the effect of law) as well as all applicable final, non-appealable judicial opinions. (J) “Community Association Dues, Fees, and Assessments” means all dues, fees, assessments and other charges that are imposed on Borrower or the Property by a condominium association, homeowners association or similar organization. (K) “Electronic Funds Transfer” means any transfer of funds, other than a transaction originated by check, draft, or similar paper instrument, which is initiated through an electronic terminal, telephonic instrument, computer, or magnetic tape so as to order, instruct, or authorize a financial institution to debit or credit an account. Such term includes, but is not limited to, point-of-sale transfers, automated teller machine transactions, transfers initiated by telephone, wire transfers, and automated clearinghouse transfers. (L) “Escrow Items” means those items that are described in Section 3. (M) “Miscellaneous Proceeds”means any compensation, settlement, award of damages, or proceeds paid by any third party (other than insurance proceeds paid under the coverages described in Section 5) for: (i) damage to, or destruction of, the Property; (ii) condemnation or other taking of all or any part of the Property; (iii) conveyance in lieu of condemnation; or (iv) misrepresentations of, or omissions as to, the value and/or condition of the Property. (N) “Mortgage Insurance” means insurance protecting Lender against the nonpayment of, or default on, the Loan. (O) “Periodic Payment” means the regularly scheduled amount due for (i) principal and interest under the Note, plus (ii) any amounts under Section 3 of this Security Instrument. (P) “RESPA” means the Real Estate Settlement Procedures Act (12 U.S.C. §2601 et seq.) and its implementing regulation, Regulation X (24 C.F.R. Part 3500), as they might be amended from time to time, or any additional or successor legislation or regulation that governs the same subject matter. As used in this Security Instrument, “RESPA” refers to all requirements and restrictions that are imposed in regard to a “federally related mortgage loan” even if the Loan does not qualify as a “federally related mortgage loan” under RESPA. (Q) “Successor in Interest of Borrower” meansany party that has taken title to the Property, whether or not that party has assumed Borrower’s obligations under the Note and/or this Security Instrument. 1.Payment of Principal, Interest, Escrow Items, Prepayment Charges, and Late Charges. Borrower shall pay when due the principal of, and interest on, the debt evidenced by the Note and any prepayment charges and late charges due under the Note. Borrower shall also pay funds for Escrow Items pursuant to Section 3. Payments due under the Note and this Security Instrument shall be made in U.S. currency. However, if any check or other instrument received by Lender as payment under the Note or this Security Instrument is returned to Lender unpaid, Lender may require that any or all subsequent payments due under the Note and this Security Instrument be made in one or more of the following forms, as selected by Lender: (a) cash; (b) money order; (c) certified check, bank check, treasurer’s check or cashier’s check, provided any such check is drawn upon an institution whose deposits are insured by a federal agency, instrumentality, or entity; or (d) Electronic Funds Transfer. 3. Funds for Escrow Items. Borrower shall pay to Lender on the day Periodic Payments are due under the Note, until the Note is paid in full, a sum (the “Funds”) to provide for payment of amounts due for: (a) taxes and assessments and other items which can attain priority over this Security Instrument as a lien or encumbrance on the Property; (b) leasehold payments or ground rents on the Property, if any; (c) premiums for any and all insurance required by Lender under Section 5; and (d) Mortgage Insurance premiums, if any, or any sums payable by Borrower to Lender in lieu of the payment of Mortgage Insurance premiums in accordance with the provisions of Section 10. These items are called “Escrow Items.” At origination or at any time during the term of the Loan, Lender may require that Community Association Dues, Fees, and Assessments, if any, be escrowed by Borrower, and such dues, fees and assessments shall be an Escrow Item. Borrower shall promptly furnish to Lender all notices of amounts to be paid under this Section. Borrower shall pay Lender the Funds for Escrow Items unless Lender waives Borrower’s obligation to pay the Funds for any or all Escrow Items. ​Lender may waive Borrower’s obligation to pay to Lender Funds for any or all Escrow Items at any time. Any such waiver may only be in writing. In the event of such waiver, Borrower shall pay directly, when and where payable, the amounts due for any Escrow Items for which payment of Funds has been waived by Lender and, if Lender requires, shall furnish to Lender receipts evidencing such payment within such time period as Lender may require. Borrower’s obligation to make such payments and to provide receipts shall for all purposes be deemed to be a covenant and agreement contained in this Security Instrument, as the phrase “covenant and agreement” is used in Section 9. If Borrower is obligated to pay Escrow Items directly, pursuant to a waiver, and Borrower fails to pay the amount due for an Escrow Item, Lender may exercise its rights under Section 9 and pay such amount and Borrower shall then be obligated under Section 9 to repay to Lender any such amount. Lender may revoke the waiver as to any or all Escrow Items at any time by a notice given in accordance with Section 15 and, upon such revocation, Borrower shall pay to Lender all Funds, and in such amounts, that are then required under this Section 3. 4. Charges; Liens. Borrower shall pay all taxes, assessments, charges, fines, and impositions attributable to the Property which can attain priority over this Security Instrument, leasehold payments or ground rents on the Property, if any, and Community Association Dues, Fees, and Assessments, if any. To the extent that these items are Escrow Items, Borrower shall pay them in the manner provided in Section 3. Borrower shall promptly discharge any lien which has priority over this Security Instrument unless Borrower: (a) agrees in writing to the payment of the obligation secured by the lien in a manner acceptable to Lender, but only so long as Borrower is performing such agreement; (b) contests the lien in good faith by, or defends against enforcement of the lien in, legal proceedings which in Lender’s opinion operate to prevent the enforcement of the lien while those proceedings are pending, but only until such proceedings are concluded; or (c) secures from the holder of the lien an agreement satisfactory to Lender subordinating the lien to this Security Instrument. If Lender determines that any part of the Property is subject to a lien which can attain priority over this Security Instrument, Lender may give Borrower a notice identifying the lien. Within 10 days of the date on which that notice is given, Borrower shall satisfy the lien or take one or more of the actions set forth above in this Section 4. 5. Property Insurance. Borrower shall keep the improvements now existing or hereafter erected on the Property insured against loss by fire, hazards included within the term “extended coverage,” and any other hazards including, but not limited to, earthquakes and floods, for which Lender requires insurance. This insurance shall be maintained in the amounts (including deductible levels) and for the periods that Lender requires. What Lender requires pursuant to the preceding sentences can change during the term of the Loan. The insurance carrier providing the insurance shall be chosen by Borrower subject to Lender’s right to disapprove Borrower’s choice, which right shall not be exercised unreasonably. Lender may require Borrower to pay, in connection with this Loan, either: (a) a one-time charge for flood zone determination, certification and tracking services; or (b) a one-time charge for flood zone determination and certification services and subsequent charges each time remappings or similar changes occur which reasonably might affect such determination or certification. Borrower shall also be responsible for the payment of any fees imposed by the Federal Emergency Management Agency in connection with the review of any flood zone determination resulting from an objection by Borrower. If Borrower fails to maintain any of the coverages described above, Lender may obtain insurance coverage, at Lender’s option and Borrower’s expense. Lender is under no obligation to purchase any particular type or amount of coverage. Therefore, such coverage shall cover Lender, but might or might not protect Borrower, Borrower’s equity in the Property, or the contents of the Property, against any risk, hazard or liability and might provide greater or lesser coverage than was previously in effect. Borrower acknowledges that the cost of the insurance coverage so obtained might significantly exceed the cost of insurance that Borrower could have obtained. Any amounts disbursed by Lender under this Section 5 shall become additional debt of Borrower secured by this Security Instrument. These amounts shall bear interest at the Note rate from the date of disbursement and shall be payable, with such interest, upon notice from Lender to Borrower requesting payment. All insurance policies required by Lender and renewals of such policies shall be subject to Lender’s right to disapprove such policies, shall include a standard mortgage clause, and shall name Lender as mortgagee and/or as an additional loss payee. Lender shall have the right to hold the policies and renewal certificates. If Lender requires, Borrower shall promptly give to Lender all receipts of paid premiums and renewal notices. If Borrower obtains any form of insurance coverage, not otherwise required by Lender, for damage to, or destruction of, the Property, such policy shall include a standard mortgage clause and shall name Lender as mortgagee and/or as an additional loss payee. In the event of loss, Borrower shall give prompt notice to the insurance carrier and Lender. Lender may make proof of loss if not made promptly by Borrower. Unless Lender and Borrower otherwise agree in writing, any insurance proceeds, whether or not the underlying insurance was required by Lender, shall be applied to restoration or repair of the Property, if the restoration or repair is economically feasible and Lender’s security is not lessened. During such repair and restoration period, Lender shall have the right to hold such insurance proceeds until Lender has had an opportunity to inspect such Property to ensure the work has been completed to Lender’s satisfaction, provided that such inspection shall be undertaken promptly. Lender may disburse proceeds for the repairs and restoration in a single payment or in a series of progress payments as the work is completed. Unless an agreement is made in writing or Applicable Law requires interest to be paid on such insurance proceeds, Lender shall not be required to pay Borrower any interest or earnings on such proceeds. Fees for public adjusters, or other third parties, retained by Borrower shall not be paid out of the insurance proceeds and shall be the sole obligation of Borrower. If the restoration or repair is not economically feasible or Lender’s security would be lessened, the insurance proceeds shall be applied to the sums secured by this Security Instrument, whether or not then due, with the excess, if any, paid to Borrower. Such insurance proceeds shall be applied in the order provided for in Section 2. If Borrower abandons the Property, Lender may file, negotiate and settle any available insurance claim and related matters. If Borrower does not respond within 30 days to a notice from Lender that the insurance carrier has offered to settle a claim, then Lender may negotiate and settle the claim. The 30-day period will begin when the notice is given. In either event, or if Lender acquires the Property under Section 22 or otherwise, Borrower hereby assigns to Lender (a) Borrower’s rights to any insurance proceeds in an amount not to exceed the amounts unpaid under the Note or this Security Instrument, and (b) any other of Borrower’s rights (other than the right to any refund of unearned premiums paid by Borrower) under all insurance policies covering the Property, insofar as such rights are applicable to the coverage of the Property. Lender may use the insurance proceeds either to repair or restore the Property or to pay amounts unpaid under the Note or this Security Instrument, whether or not then due. 6. Occupancy. Borrower shall occupy, establish, and use the Property as Borrower’s principal residence within 60 days after the execution of this Security Instrument and shall continue to occupy the Property as Borrower’s principal residence for at least one year after the date of occupancy, unless Lender otherwise agrees in writing, which consent shall not be unreasonably withheld, or unless extenuating circumstances exist which are beyond Borrower’s control. 7. Preservation, Maintenance and Protection of the Property; Inspections. Borrower shall not destroy, damage or impair the Property, allow the Property to deteriorate or commit waste on the Property. Whether or not Borrower is residing in the Property, Borrower shall maintain the Property in order to prevent the Property from deteriorating or decreasing in value due to its condition. Unless it is determined pursuant to Section 5 that repair or restoration is not economically feasible, Borrower shall promptly repair the Property if damaged to avoid further deterioration or damage. If insurance or condemnation proceeds are paid in connection with damage to, or the taking of, the Property, Borrower shall be responsible for repairing or restoring the Property only if Lender has released proceeds for such purposes. Lender may disburse proceeds for the repairs and restoration in a single payment or in a series of progress payments as the work is completed. If the insurance or condemnation proceeds are not sufficient to repair or restore the Property, Borrower is not relieved of Borrower’s obligation for the completion of such repair or restoration. 8. Borrower’s Loan Application. Borrower shall be in default if, during the Loan application process, Borrower or any persons or entities acting at the direction of Borrower or with Borrower’s knowledge or consent gave materially false, misleading, or inaccurate information or statements to Lender (or failed to provide Lender with material information) in connection with the Loan. Material representations include, but are not limited to, representations concerning Borrower’s occupancy of the Property as Borrower’s principal residence. 9. Protection of Lender’s Interest in the Property and Rights Under this Security Instrument. If (a) Borrower fails to perform the covenants and agreements contained in this Security Instrument, (b) there is a legal proceeding that might significantly affect Lender’s interest in the Property and/or rights under this Security Instrument (such as a proceeding in bankruptcy, probate, for condemnation or forfeiture, for enforcement of a lien which may attain priority over this Security Instrument or to enforce laws or regulations), or (c) Borrower has abandoned the Property, then Lender may do and pay for whatever is reasonable or appropriate to protect Lender’s interest in the Property and rights under this Security Instrument, including protecting and/or assessing the value of the Property, and securing and/or repairing the Property.Lender’s actions can include, but are not limited to: (a) paying any sums secured by a lien which has priority over this Security Instrument; (b) appearing in court; and (c) paying reasonable attorneys’ fees to protect its interest in the Property and/or rights under this Security Instrument, including its secured position in a bankruptcy proceeding. Securing the Property includes, but is not limited to, entering the Property to make repairs, change locks, replace or board up doors and windows, drain water from pipes, eliminate building or other code violations or dangerous conditions, and have utilities turned on or off. Although Lender may take action under this Section 9, Lender does not have to do so and is not under any duty or obligation to do so. It is agreed that Lender incurs no liability for not taking any or all actions authorized under this Section 9. 10. Mortgage Insurance. If Lender required Mortgage Insurance as a condition of making the Loan, Borrower shall pay the premiums required to maintain the Mortgage Insurance in effect. If, for any reason, the Mortgage Insurance coverage required by Lender ceases to be available from the mortgage insurer that previously provided such insurance and Borrower was required to make separately designated payments toward the premiums for Mortgage Insurance, Borrower shall pay the premiums required to obtain coverage substantially equivalent to the Mortgage Insurance previously in effect, at a cost substantially equivalent to the cost to Borrower of the Mortgage Insurance previously in effect, from an alternate mortgage insurer selected by Lender. If substantially equivalent Mortgage Insurance coverage is not available, Borrower shall continue to pay to Lender the amount of the separately designated payments that were due when the insurance coverage ceased to be in effect. Lender will accept, use and retain these payments as a non-refundable loss reserve in lieu of Mortgage Insurance. Such loss reserve shall be non-refundable, notwithstanding the fact that the Loan is ultimately paid in full, and Lender shall not be required to pay Borrower any interest or earnings on such loss reserve. Lender can no longer require loss reserve payments if Mortgage Insurance coverage (in the amount and for the period that Lender requires) provided by an insurer selected by Lender again becomes available, is obtained, and Lender requires separately designated payments toward the premiums for Mortgage Insurance. If Lender required Mortgage Insurance as a condition of making the Loan and Borrower was required to make separately designated payments toward the premiums for Mortgage Insurance, Borrower shall pay the premiums required to maintain Mortgage Insurance in effect, or to provide a non-refundable loss reserve, until Lender’s requirement for Mortgage Insurance ends in accordance with any written agreement between Borrower and Lender providing for such termination or until termination is required by Applicable Law. Nothing in this Section 10 affects Borrower’s obligation to pay interest at the rate provided in the Note. (b) Any such agreements will not affect the rights Borrower has – if any – with respect to the Mortgage Insurance under the Homeowners Protection Act of 1998 or any other law. These rights may include the right to receive certain disclosures, to request and obtain cancellation of the Mortgage Insurance, to have the Mortgage Insurance terminated automatically, and/or to receive a refund of any Mortgage Insurance premiums that were unearned at the time of such cancellation or termination. 11.Assignment of Miscellaneous Proceeds; Forfeiture. All Miscellaneous Proceeds are hereby assigned to and shall be paid to Lender. If the Property is damaged, such Miscellaneous Proceeds shall be applied to restoration or repair of the Property, if the restoration or repair is economically feasible and Lender’s security is not lessened. During such repair and restoration period, Lender shall have the right to hold such Miscellaneous Proceeds until Lender has had an opportunity to inspect such Property to ensure the work has been completed to Lender’s satisfaction, provided that such inspection shall be undertaken promptly. Lender may pay for the repairs and restoration in a single disbursement or in a series of progress payments as the work is completed. Unless an agreement is made in writing or Applicable Law requires interest to be paid on such Miscellaneous Proceeds, Lender shall not be required to pay Borrower any interest or earnings on such Miscellaneous Proceeds. If the restoration or repair is not economically feasible or Lender’s security would be lessened, the Miscellaneous Proceeds shall be applied to the sums secured by this Security Instrument, whether or not then due, with the excess, if any, paid to Borrower. Such Miscellaneous Proceeds shall be applied in the order provided for in Section 2. If the Property is abandoned by Borrower, or if, after notice by Lender to Borrower that the Opposing Party (as defined in the next sentence) offers to make an award to settle a claim for damages, Borrower fails to respond to Lender within 30 days after the date the notice is given, Lender is authorized to collect and apply the Miscellaneous Proceeds either to restoration or repair of the Property or to the sums secured by this Security Instrument, whether or not then due. “Opposing Party” means the third party that owes Borrower Miscellaneous Proceeds or the party against whom Borrower has a right of action in regard to Miscellaneous Proceeds. Borrower shall be in default if any action or proceeding, whether civil or criminal, is begun that, in Lender’s judgment, could result in forfeiture of the Property or other material impairment of Lender’s interest in the Property or rights under this Security Instrument. Borrower can cure such a default and, if acceleration has occurred, reinstate as provided in Section 19, by causing the action or proceeding to be dismissed with a ruling that, in Lender’s judgment, precludes forfeiture of the Property or other material impairment of Lender’s interest in the Property or rights under this Security Instrument. The proceeds of any award or claim for damages that are attributable to the impairment of Lender’s interest in the Property are hereby assigned and shall be paid to Lender. 12. Borrower Not Released; Forbearance By Lender Not a Waiver. Extension of the time for payment or modification of amortization of the sums secured by this Security Instrument granted by Lender to Borrower or any Successor in Interest of Borrower shall not operate to release the liability of Borrower or any Successors in Interest of Borrower. Lender shall not be required to commence proceedings against any Successor in Interest of Borrower or to refuse to extend time for payment or otherwise modify amortization of the sums secured by this Security Instrument by reason of any demand made by the original Borrower or any Successors in Interest of Borrower. Any forbearance by Lender in exercising any right or remedy including, without limitation, Lender’s acceptance of payments from third persons, entities or Successors in Interest of Borrower or in amounts less than the amount then due, shall not be a waiver of or preclude the exercise of any right or remedy. 13. Joint and Several Liability; Co-signers; Successors and Assigns Bound. Borrower covenants and agrees that Borrower’s obligations and liability shall be joint and several. However, any Borrower who co-signs this Security Instrument but does not execute the Note (a “co-signer”): (a) is co-signing this Security Instrument only to mortgage, grant and convey the co-signer’s interest in the Property under the terms of this Security Instrument; (b) is not personally obligated to pay the sums secured by this Security Instrument; and (c) agrees that Lender and any other Borrower can agree to extend, modify, forbear or make any accommodations with regard to the terms of this Security Instrument or the Note without the co-signer’s consent. Subject to the provisions of Section 18, any Successor in Interest of Borrower who assumes Borrower’s obligations under this Security Instrument in writing, and is approved by Lender, shall obtain all of Borrower’s rights and benefits under this Security Instrument. Borrower shall not be released from Borrower’s obligations and liability under this Security Instrument unless Lender agrees to such release in writing. The covenants and agreements of this Security Instrument shall bind (except as provided in Section 20) and benefit the successors and assigns of Lender. 14. Loan Charges. 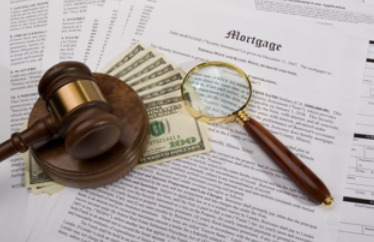 Lender may charge Borrower fees for services performed in connection with Borrower’s default, for the purpose of protecting Lender’s interest in the Property and rights under this Security Instrument, including, but not limited to, attorneys’ fees, property inspection and valuation fees. In regard to any other fees, the absence of express authority in this Security Instrument to charge a specific fee to Borrower shall not be construed as a prohibition on the charging of such fee. Lender may not charge fees that are expressly prohibited by this Security Instrument or by Applicable Law. If the Loan is subject to a law which sets maximum loan charges, and that law is finally interpreted so that the interest or other loan charges collected or to be collected in connection with the Loan exceed the permitted limits, then: (a) any such loan charge shall be reduced by the amount necessary to reduce the charge to the permitted limit; and (b) any sums already collected from Borrower which exceeded permitted limits will be refunded to Borrower. Lender may choose to make this refund by reducing the principal owed under the Note or by making a direct payment to Borrower. If a refund reduces principal, the reduction will be treated as a partial prepayment without any prepayment charge (whether or not a prepayment charge is provided for under the Note). Borrower’s acceptance of any such refund made by direct payment to Borrower will constitute a waiver of any right of action Borrower might have arising out of such overcharge. 15. Notices.All notices given by Borrower or Lender in connection with this Security Instrument must be in writing. Any notice to Borrower in connection with this Security Instrument shall be deemed to have been given to Borrower when mailed by first class mail or when actually delivered to Borrower’s notice address if sent by other means. Notice to any one Borrower shall constitute notice to all Borrowers unless Applicable Law expressly requires otherwise. The notice address shall be the Property Address unless Borrower has designated a substitute notice address by notice to Lender. Borrower shall promptly notify Lender of Borrower’s change of address. If Lender specifies a procedure for reporting Borrower’s change of address, then Borrower shall only report a change of address through that specified procedure. There may be only one designated notice address under this Security Instrument at any one time. ​ Any notice to Lender shall be given by delivering it or by mailing it by first class mail to Lender’s address stated herein unless Lender has designated another address by notice to Borrower. Any notice in connection with this Security Instrument shall not be deemed to have been given to Lender until actually received by Lender. If any notice required by this Security Instrument is also required under Applicable Law, the Applicable Law requirement will satisfy the corresponding requirement under this Security Instrument. 16. Governing Law; Severability; Rules of Construction. This Security Instrument shall be governed by federal law and the law of the jurisdiction in which the Property is located. All rights and obligations contained in this Security Instrument are subject to any requirements and limitations of Applicable Law. Applicable Law might explicitly or implicitly allow the parties to agree by contract or it might be silent, but such silence shall not be construed as a prohibition against agreement by contract. In the event that any provision or clause of this Security Instrument or the Note conflicts with Applicable Law, such conflict shall not affect other provisions of this Security Instrument or the Note which can be given effect without the conflicting provision. As used in this Security Instrument: (a) words of the masculine gender shall mean and include corresponding neuter words or words of the feminine gender; (b) words in the singular shall mean and include the plural and vice versa; and (c) the word “may” gives sole discretion without any obligation to take any action. 17. Borrower’s Copy. Borrower shall be given one copy of the Note and of this Security Instrument. 18. Transfer of the Property or a Beneficial Interest in Borrower. As used in this Section 18, “Interest in the Property”means any legal or beneficial interest in the Property, including, but not limited to, those beneficial interests transferred in a bond for deed, contract for deed, installment sales contract or escrow agreement, the intent of which is the transfer of title by Borrower at a future date to a purchaser. If all or any part of the Property or any Interest in the Property is sold or transferred (or if Borrower is not a natural person and a beneficial interest in Borrower is sold or transferred) without Lender’s prior written consent, Lender may require immediate payment in full of all sums secured by this Security Instrument. However, this option shall not be exercised by Lender if such exercise is prohibited by Applicable Law. 19. Borrower’s Right to Reinstate After Acceleration. If Borrower meets certain conditions, Borrower shall have the right to have enforcement of this Security Instrument discontinued at any time prior to the earliest of: (a) five days before sale of the Property pursuant to any power of sale contained in this Security Instrument; (b) such other period as Applicable Law might specify for the termination of Borrower’s right to reinstate; or (c) entry of a judgment enforcing this Security Instrument. Those conditions are that Borrower: (a) pays Lender all sums which then would be due under this Security Instrument and the Note as if no acceleration had occurred; (b) cures any default of any other covenants or agreements; (c) pays all expenses incurred in enforcing this Security Instrument, including, but not limited to, reasonable attorneys’ fees, property inspection and valuation fees, and other fees incurred for the purpose of protecting Lender’s interest in the Property and rights under this Security Instrument; and (d) takes such action as Lender may reasonably require to assure that Lender’s interest in the Property and rights under this Security Instrument, and Borrower’s obligation to pay the sums secured by this Security Instrument, shall continue unchanged. Lender may require that Borrower pay such reinstatement sums and expenses in one or more of the following forms, as selected by Lender: (a) cash; (b) money order; (c) certified check, bank check, treasurer’s check or cashier’s check, provided any such check is drawn upon an institution whose deposits are insured by a federal agency, instrumentality or entity; or (d) Electronic Funds Transfer. Upon reinstatement by Borrower, this Security Instrument and obligations secured hereby shall remain fully effective as if no acceleration had occurred. However, this right to reinstate shall not apply in the case of acceleration under Section 18. 20. Sale of Note; Change of Loan Servicer; Notice of Grievance. The Note or a partial interest in the Note (together with this Security Instrument) can be sold one or more times without prior notice to Borrower. A sale might result in a change in the entity (known as the “Loan Servicer”) that collects Periodic Payments due under the Note and this Security Instrument and performs other mortgage loan servicing obligations under the Note, this Security Instrument, and Applicable Law. There also might be one or more changes of the Loan Servicer unrelated to a sale of the Note. If there is a change of the Loan Servicer, Borrower will be given written notice of the change which will state the name and address of the new Loan Servicer, the address to which payments should be made and any other information RESPA requires in connection with a notice of transfer of servicing. If the Note is sold and thereafter the Loan is serviced by a Loan Servicer other than the purchaser of the Note, the mortgage loan servicing obligations to Borrower will remain with the Loan Servicer or be transferred to a successor Loan Servicer and are not assumed by the Note purchaser unless otherwise provided by the Note purchaser. 21. Hazardous Substances. As used in this Section 21: (a) “Hazardous Substances” are those substances defined as toxic or hazardous substances, pollutants, or wastes by Environmental Law and the following substances: gasoline, kerosene, other flammable or toxic petroleum products, toxic pesticides and herbicides, volatile solvents, materials containing asbestos or formaldehyde, and radioactive materials; (b) “Environmental Law” means federal laws and laws of the jurisdiction where the Property is located that relate to health, safety or environmental protection; (c) “Environmental Cleanup” includes any response action, remedial action, or removal action, as defined in Environmental Law; and (d) an “Environmental Condition” means a condition that can cause, contribute to, or otherwise trigger an Environmental Cleanup. 22. Acceleration; Remedies. Lender shall give notice to Borrower prior to acceleration following Borrower’s breach of any covenant or agreement in this Security Instrument (but not prior to acceleration under Section 18 unless Applicable Law provides otherwise). The notice shall specify: (a) the default; (b) the action required to cure the default; (c) a date, not less than 30 days from the date the notice is given to Borrower, by which the default must be cured; and (d) that failure to cure the default on or before the date specified in the notice may result in acceleration of the sums secured by this Security Instrument and sale of the Property at public auction at a date not less than 120 days in the future.The notice shall further inform Borrower of the right to reinstate after acceleration, the right to bring a court action to assert the non-existence of a default or any other defense of Borrower to acceleration and sale, and any other matters required to be included in the notice by Applicable Law. If the default is not cured on or before the date specified in the notice, Lender at its option, may require immediate payment in full of all sums secured by this Security Instrument without further demand and may invoke the power of sale and/or any other remedies permitted by Applicable Law. Lender shall be entitled to collect all expenses incurred in pursuing the remedies provided in this Section 22, including, but not limited to, reasonable attorneys’ fees and costs of title evidence. If Lender invokes the power of sale, Lender shall give written notice to Trustee of the occurrence of an event of default and of Lender’s election to cause the Property to be sold. Trustee and Lender shall take such action regarding notice of sale and shall give such notices to Borrower and to other persons as Applicable Law may require. After the time required by Applicable Law and after publication of the notice of sale, Trustee, without demand on Borrower, shall sell the Property at public auction to the highest bidder at the time and place and under the terms designated in the notice of sale in one or more parcels and in any order Trustee determines. Trustee may postpone sale of the Property for a period or periods permitted by Applicable Law by public announcement at the time and place fixed in the notice of sale. Lender or its designee may purchase the Property at any sale. Trustee shall deliver to the purchaser Trustee’s deed conveying the Property without any covenant or warranty, expressed or implied. The recitals in the Trustee’s deed shall be prima facie evidence of the truth of the statements made therein. Trustee shall apply the proceeds of the sale in the following order: (a) to all expenses of the sale, including, but not limited to, reasonable Trustee’s and attorneys’ fees; (b) to all sums secured by this Security Instrument; and (c) any excess to the person or persons legally entitled to it or to the clerk of the superior court of the county in which the sale took place. 23. Reconveyance. Upon payment of all sums secured by this Security Instrument, Lender shall request Trustee to reconvey the Property and shall surrender this Security Instrument and all notes evidencing debt secured by this Security Instrument to Trustee. Trustee shall reconvey the Property without warranty to the person or persons legally entitled to it. Such person or persons shall pay any recordation costs and the Trustee’s fee for preparing the reconveyance. 24. Substitute Trustee. In accordance with Applicable Law, Lender may from time to time appoint a successor trustee to any Trustee appointed hereunder who has ceased to act. Without conveyance of the Property, the successor trustee shall succeed to all the title, power and duties conferred upon Trustee herein and by Applicable Law. 25. Use of Property. The Property is not used principally for agricultural purposes. 26. Attorneys’ Fees. Lender shall be entitled to recover its reasonable attorneys’ fees and costs in any action or proceeding to construe or enforce any term of this Security Instrument. The term “attorneys’ fees,” whenever used in this Security Instrument, shall include without limitation attorneys’ fees incurred by Lender in any bankruptcy proceeding or on appeal. It is a well known fact that a majority of homeowners do not read their mortgage contract prior to, or after purchasing their home. If you did, you probably wouldn't understand it anyway. Needless to say, you are still bound by the covenants. Below is a blank original "Deed of Trust" mortgage contract provided for your review. It can be found on the FannieMae website. It is the uniform security instrument used by lending institutions for most mortgages issued throughout the United States. We ask that you pay close attention to the yellow and green highlighted language of this contract. In particular, please read Sections 7, 9, 16, 17, 18, 20 and 22. ​These sections underscore your rights and protections as established in this agreement. As much as it is the mission of the Home Equity Protection Services team to secure and protect the equitable interest you build in your home, it is also our responsibility to educate our members. One final note to keep in mind: ALL contracts are "mutually binding." In other words, what applies to the Borrower, no less applies to the Lender (See Section 16 of your Mortgage Deed). On that note, we look forward to helping you Secure and Protect your most valuable asset, your home and its equity. Don't forget to visit our FAQ summary that will answer many of the question you may have.